How Can You Tell if a Turtle Is Growing? Turtles aren't known for speed, in movement or in growth rate. Turtle maturation varies by species as well as by nutrition. If you're curious about your pet turtle's growth, keep careful records. Find a veterinarian specializing in turtle health to regularly examine your turtle and advise you. A turtle's shell consists of scutes or bone plates. As the animal grows, the outer bone plate sheds, with new, bigger plates emerging underneath. When an old scute sheds, its replacement displays an additional ring on the outer edge. By counting the scutes' rings, you might determine a turtle's age. It's similar to the growth rings within a tree's trunk. However, counting turtle growth rings only gives you an approximate age, as a turtle might shed scutes more than annually. The best way to tell if your young turtle is growing is by regularly measuring his shell. The health of his shell indicates his overall health. If you raise your turtle from a hatchling, he should have a complete shell by his first birthday. Healthy shells are firm to the touch and free of lumps and pitting. If you notice lesions on your pet's shell, take him to the vet immediately. Check your turtle's shell thoroughly at least once a week. Since measuring is so simple, do that during your weekly check or perhaps semi-monthly. When you take your pet in for his annual physical, show your vet the turtle's overall growth rate from the previous year. That can help her advise you about care if the turtle's growth rate is abnormally slow or fast. Red-eared sliders are among the most common pet turtles. Their growth rate varies depending on food availability and quantity. Their sexual maturity depends on reaching a certain size, not a specific age. A male red-eared slider reaches sexual maturity when his shell is approximately 4 inches long. Depending on nutrition, that's between the ages of 2 and 5 years. A female's upper shell must reach 6 to 7 inches in length before she's sexually mature, which occurs between the ages of 5 and 7 years. 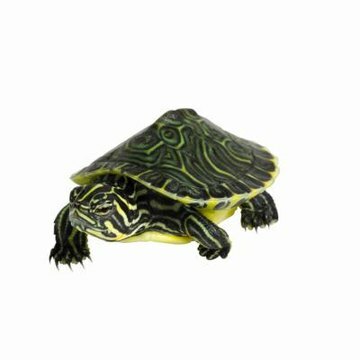 To ensure your pet turtle grows at a normal rate and doesn't become stunted, feed him properly. Young turtles require more protein than older ones. A high-quality commercial turtle food can make up to 50 percent of the diet. Ask your veterinarian for commercial food recommendations. Additionally, feed your pets protein including earthworms and cooked chicken. Fresh, dark green leaf vegetables should make up the other half of the adult diet. These include collard greens or dandelion greens, turtle favorites. You can feed dandelion greens from your lawn if you don't use pesticides. Your turtles can also consume small amounts of carrot, green beans or squash. Offer berries or small pieces of fruit as treats.